What touches my heart? 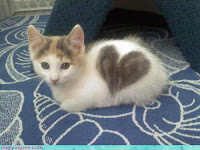 A myriad of things brings a tear to the eye and a smile to my face -- kittens, babies, the people I love. While those wonderful things might garner an “aww,” or a “that’s nice,” or even a “bless your heart,” talking about them won’t really entertain you. Have you already fallen asleep? Well let me wake you up with my geeky love of science. And Pluto. YES, PLUTO. With Valentine’s day just around the corner, we must honor the planet that literally wears a heart on its surface (See photo below). I’ve been fascinated with little Pluto since the day I memorized the name of the nine planets. Obviously, I know Pluto is no longer a planet. 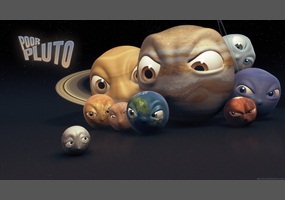 Really, is there anyone on normal-sided planet Earth who doesn’t know poor Pluto is now a dwarf? Frankly, I don’t get all the fuss? After all, isn’t being a dwarf planet far preferable to being a gas giant? Pluto is actually the kitten of the solar system—just look at the picture, all crimson and shiny white heart. Almost makes you want to hug it. Like most heroes, Pluto has been greatly misunderstood. Discovered in 1930, scientists thought Pluto was a cold dead world, not unlike our moon, although Pluto is only two-thirds the diameter of the moon. Then the New Horizons mission by NASA changed all that. We now know the planet has an active geology with ice volcanoes; a mountain range 11,000 feet tall; and a subsurface ocean. Even though tiny Pluto is over 3.5 billion miles from the sun, some scientists believe it might harbor primitive life. There’s a lot packed into that little dwarf. Pluto epitomizes the wonders of discovery. This little planet—excuse me, dwarf planet--demonstrates that things are not always what they seem. In a remote way, it demonstrates that good things do come in small packages. It also reminds us that we have so much to learn, and that there is joy in the learning. It gives us hope for life, both alien and humankind. And I hope you have a fabulous Valentine’s day. Great Geeky post, Robin. 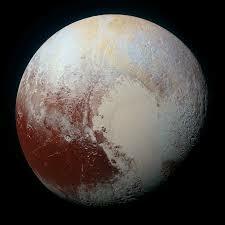 I hadn't noticed that Pluto wore a heart but I can certainly see it in the picture you shared. Yes, you always entertain! And I learned a few things, too. Happy Valentine's Day. Enjoyed the read! Hope you have a fabulous Valentine’s day as well! Lo ed the article! As always you come up with an off beat topic. Pluto is now my second-favorite planet, dwarf or not, next to Earth. What a fun post! Love the photo, too! Thank you, Robin. As always a good time. How cool that Pluto wears a heart! And I didn't know the scientists suspect the dwarf planet may harbour life. Thanks for teaching me something new. I love your geeky posts. And thank you for highlighting Pluto. I've never agreed with the re-designation of Pluto. :) Yes, I know all the reasons, but I still don't agree. If they can name gillions of moons (okay a slight exaggeration) zooming around Saturn or Jupiter which are equally uninhabitable (just because they are gas giants doesn't make them more a planet IMO), why can't they keep steadfast Pluto as an official planet in our salar system? I like it's unusual orbit around the sun. It's independent. I also wrote a short story for an SF anthology about it's moon, Charon, the largest of Pluto's 5 moons. That's another thing, if Pluto has 5 moons it is certainly a planet (at least in my view). ahhh, so now it is "Dwarf"? Guess it would be politically incorrect to call Pluto a midget planet... I mean, isn't Pluto a "Little" planet? or a small stature planet? Miniature planet? Is Dwarfism something that other planets have? is being little an asset to future activities, or will it limit Pluto? and will Pluto ever really survive without Mickey? Loved, loved, loved this post! I did not know Pluto had a heart on it. I learned a lot. Wow. I learned a lot about Pluto. That it mught have life on it is cool.No pun intended. Thanks.